This article is about the enemy debuting in Super Mario 64. For the character in Mario Party Advance, see Mr. I (character). A Mr. I (originally parsed Mr. I.) is an enemy species in the Mario franchise. Its name is self-descriptive; they seem to be nothing more than a giant eyeball. Additionally, Mr. I are usually completely immobile, as they can only rotate around in place. A Mr. I from Super Mario 64 DS. A Mr. I shooting a bubble. 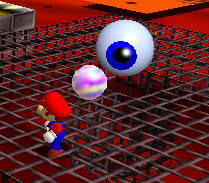 They first appear in Super Mario 64, where the only thing they can do is shoot pink bubbles at Mario from their pupils. They always watch Mario when he is close, and can be dizzied into submission if Mario runs in a circle around them in either direction, rewarding Mario with a Blue Coin. The much larger version, Big Mr. I, is in the attic of Big Boo's Haunt. The standard Mr. I can be found in Big Boo's Haunt, Lethal Lava Land, and the Hazy Maze Cave. 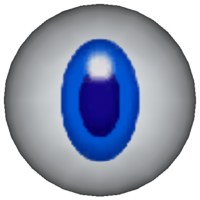 In the remake, their pupils are now oval-shaped, and said pupils are now dark blue instead of black. Also, the bubbles were changed to balls of light that change color, but are primarily turquoise. Mr. I from Mario Party 2. Big Mr. I appears in Mario Party 2 in the Horror Land board, where he offers to "warp" the player across the board for ten coins, though his "warping" actually involves him rolling and chasing the player (and any others along the route) to the other side of the board. In Mario Party 3, a few Mr. I appear in the battle minigame Eye Sore, where the player has to run around them in order to win. A Mr. I later appears in Mario Party 5 as a weapon in Super Duel Mode. It shoots a blue laser to stun enemies. In Mario Party Advance, a notable Mr. I appears as a resident of the Horror Area; he is in love with Princess Peach. Two Mr. Is in the minigame Eyebrawl in Mario Party 8. In Mario Party 8, Mr. I and Big Mr. I appear in the minigame Eyebrawl, where instead of running around them like in the Eye Sore minigame, the player must draw circles around them with the Wii Remote. In this game, Mr. I take on a more oblong shape. Whoever gets Mr. I dizzy first wins the minigame. The loser is haunted by Mr. I. It's an eye. A big, juicy, unblinking ever-watching eye. ...Gross. In Super Paper Mario, Mr. I, identified as Mister I, appears in Merlee's Mansion and Castle Bleck; these Mr. I are immune to conventional attacks, and can only be defeated by running around them repeatedly while using Mario's Flip technique. Alternatively, the player may use Fleep's ability on them to defeat much easier. In this appearance, Mr. I attack the player by shooting them with a cyan laser beam. The game also introduces a sub-species of Mr. I called Red I.
German Glubsch Comparable to "goggle". Italian Mr. O "O" is the first letter of occhio, meaning "eye". In the files for the Super Mario Mash-Up Pack in Minecraft: Wii U Edition, there is a picture of an Ender Chest with a Mr. I on it. The concept for the Mr. I chests was scrapped before the final release, where they are Shy Guy-themed instead. This page was last edited on March 1, 2019, at 18:14.